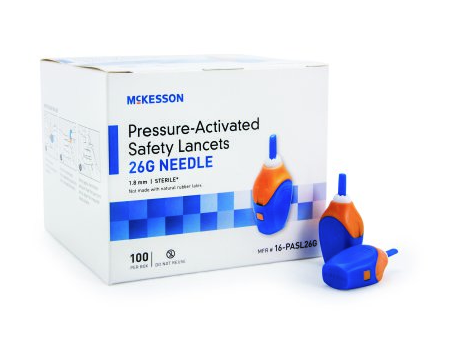 McKesson Pressure-Activated Safety Lancets are used by medical professionals for capillary blood sampling and diagnostic testing and is used by individuals who test their daily blood sugars. The diabetic lancet safely pricks the fingertip in one simple step to obtain a small amount of blood specimen for sampling. The pressure-activated design simply releases the lancet when slight pressure is applied and then retracts immediately to prevent sharps injury and cross-contamination. The lancet is for single use only. It comes ready to use with a sterile tri-beveled needle loaded. 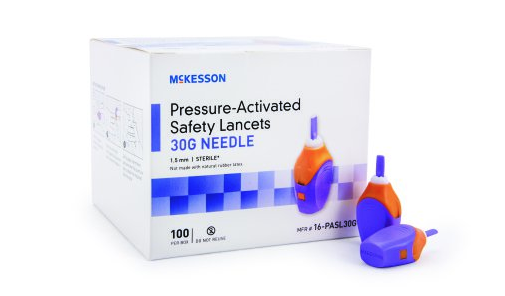 Pressure Activated Safety Lancets in 21, 26 and 30 gauge provide different needle stick penetration depth levels for different medical applications and skin types. The 21G needle produces 2.0 mm depth for regular blood flow for blood sampling. Choose 26G for 1.8 mm depth for low blood flow when testing blood glucose and cholesterol. It's also effective for testing coagulation and blood gas levels. Lastly, the 30G needle creates a 1.5 depth for micro blood flow for any blood testing that only requires a small blood sample. 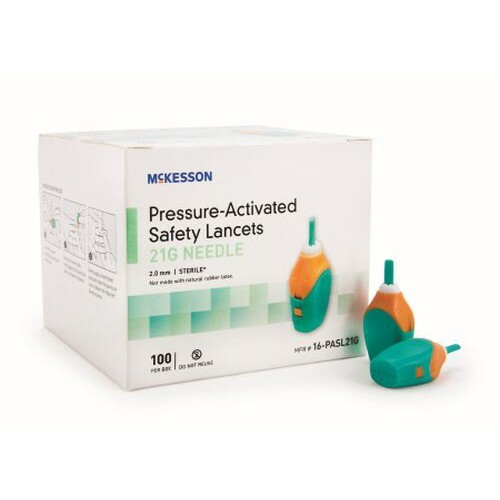 Pressure-Activated Safety Lancets are available in a box of 100 lancets or a case of 20 boxes to total 2000 sterile lancets. The gauge is color coded for easy detection with Green for 21G, Blue for 26GK and Purple for 30G. Make sure to prepare the skin prior to pricking the finger by washing with mild soap and water. You can also cleanse the skin with Isopropyl Rubbing Alcohol also manufactured by McKesson.